Sen. Tom Harkin (D-Iowa) calls Republicans “dead-beat debtors” among other things during a Democratic press conference on Wednesday morning. “The debate and fight is not between Democrats and Republicans. It’s between some Republicans and their sort of cult fringe as I refer to them out there,” Harkin said. “Democrats are willing to do whatever is necessary to raise the debt ceiling, not for future borrowing but to pay the debts that we racked up in the past. Which, mostly was racked up by a Republican House, a Republican Senate and a Republican President in the last 8 years. Yet, they’re not willing to pay the bills,” Harkin said. 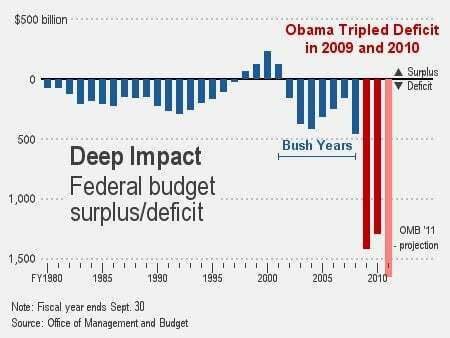 Obama tripled the deficit his first year with the failed Obama-Pelosi stimulus plan. In Obama’s second year the deficit topped a trillion dollars again. Of course, the corrupt US media won’t correct this filthy liar… They’ll applaud him.